LOVELL. LOVELL married Beulah COWAN. Beulah COWAN [Parents] was born on 21 Jul 1894 in Deanville, Burleson, Texas. She died in Jul 1922. Beulah married LOVELL. Walter Richard BATES was born on 3 Mar 1896 in Dewville, Guadalupe, Texas. He died on 29 Mar 1955 in At Home in Hatch, Dona Anna, New Mexico. He was buried in Garden of Memoris, Hatch, Dona Anna, New Mexico. Walter married Verna COWAN on 20 Jan 1920 in Pear Valley, Brazoria, Texas. Verna COWAN [Parents] was born on 6 Jun 1898 in Deanville, Burleson, Texas. 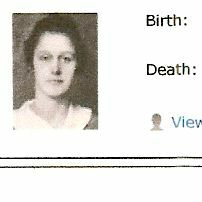 She died on 21 Feb 1987 in Radium Springs, Hatch, Dona Anna, New Mexico. She was buried in Garden of Memoris, Hatch, Dona Anna, New Mexico. 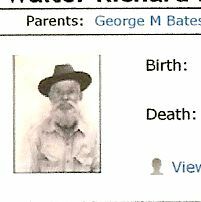 Verna married Walter Richard BATES on 20 Jan 1920 in Pear Valley, Brazoria, Texas. F i Rachel Lorene BATES was born on 29 Nov 1920. She died on 26 Sep 1956. M ii Elbert BATES was born on 6 Feb 1922. F iii Dorothy Irene BATES was born on 29 Nov 1923. F iv Viola BATES was born on 9 Apr 1925. She died on 22 Jul 1999. M v BATES was born about 1927. F vi BATES was born about 1930. F vii Muriel Bernice BATES was born on 10 Mar 1939. She died on 4 Feb 2015. Richard Audraine Hershel STOREY was born on 7 Aug 1918 in Mountainair, Torrance, New Mexico. He died on 6 Apr 1992 in , , Colorado. Richard married Rachel Lorene BATES on 14 Jul 1937 in , , New Mexico. Rachel Lorene BATES [Parents] was born on 29 Nov 1920 in Lohn, McCulloch, Texas. She died on 26 Sep 1956 in Albuquerque, Bernalillo, New Mexico. She was buried in Fairview Memorial Park, Albuquerque, Bernalillo, New Mexico. Rachel married Richard Audraine Hershel STOREY on 14 Jul 1937 in , , New Mexico. STOREY was born about 1938. Elbert BATES [Parents] was born on 6 Feb 1922 in , , Texas. Elbert married Edna Norine "Nan" ATTAWAY on 4 Jun 1942 in Deming, Luna, New Mexico. Edna Norine "Nan" ATTAWAY was born on 28 May 1921 in Farmington, San Juan, New Mexico. Edna married Elbert BATES on 4 Jun 1942 in Deming, Luna, New Mexico. Wilburn SCHOONOVER. Wilburn married Dorothy Irene BATES. Dorothy Irene BATES [Parents] was born on 29 Nov 1923 in Big Springs, Howard, Texas. Dorothy married Wilburn SCHOONOVER. Paul Daine WILKINSON. Paul married Viola BATES. Viola BATES [Parents] was born on 9 Apr 1925 in Richland Springs, San Saba, Texas. She died on 22 Jul 1999 in Wolfe, Hunt, Texas. Viola married Paul Daine WILKINSON. BATES [Parents] was born about 1927. BATES married Betty MC MANIS. Betty MC MANIS. Betty married BATES. BATES [Parents] was born about 1927. BATES married Barbara COOK. Barbara COOK. Barbara married BATES. BATES [Parents] was born about 1927. BATES married June. Lee Wayne PREECE was born on 23 Jan 1930 in , , Arizona. He died on 6 Apr 2000 in Radium Springs, , New Mexico. Lee married BATES on 13 Jan 1954. BATES [Parents] was born about 1930. BATES married Lee Wayne PREECE on 13 Jan 1954.